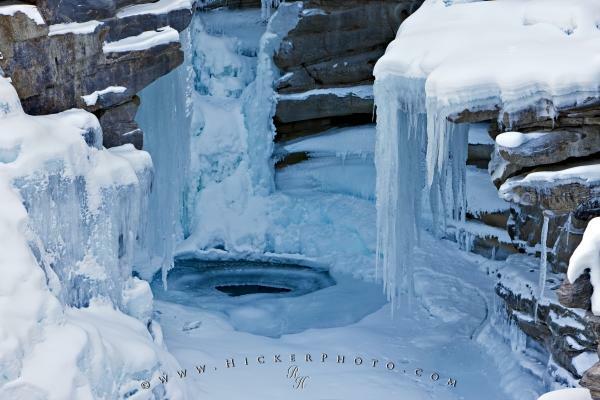 Tiers of beautiful formations made of snow and ice form during winter on the Athabasca Falls. Winter pictures with their contrasts of white snow with the dark landscape make for some interesting background pictures. Snow and Ice formations on the Athabasca Falls during winter with rock walls in the background, Athabasca River, Jasper National Park, Canadian Rocky Mountains, Alberta, Canada. Jasper National Park forms part of the Canadian Rocky Mountain Parks UNESCO World Heritage Site. Background photo of snow collecting on ice formations of the Athabasca Falls during winter. Pictures from photo gallery "Ice Pictures"
This picture is part of the photo album "Ice Pictures" - there are more beautiful images waiting for you.